Slain: Back From Hell was one of those indie games that didn't look like much until you sat down to play it, and then discovered that, actually, it was really bloody good fun. Mixing a love of Castlevania with a love for head bangin' heavy metal, Slain is one of those slow burner games that we think people will continue to discover - and love - in the years ahead. Related reading: Brad's review of Slain: Back From Hell. So, what do you think? 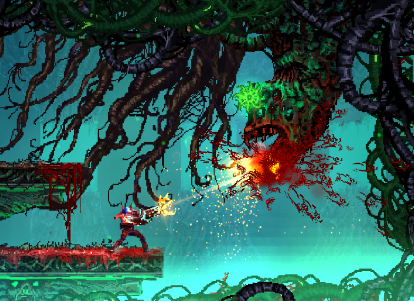 With a bit of refinement, Slain could have been an all-time indie classic. Perhaps Valfaris is that refinement in action.